The magnificent view south, from the Old Ski Bowl. Last weekend, after leading the Cub Scouts on a hike through Panther Meadow, we headed up to the Old Ski Bowl to watch the sun set, drink hot chocolate and enjoy the spectacular scenery. It was spectacular as always but it was made even better by the thin layers of smoke from the still smoldering fires. The slight haze allowed each layer of the mountains to be highlighted. Even better, it caused the color gradient in the sky to be especially dramatic. These are braided folds indeed. It may only look like a sliver of the image but it is a bit deceiving. The zoom lens compresses the image, making the area appear smaller than it is. 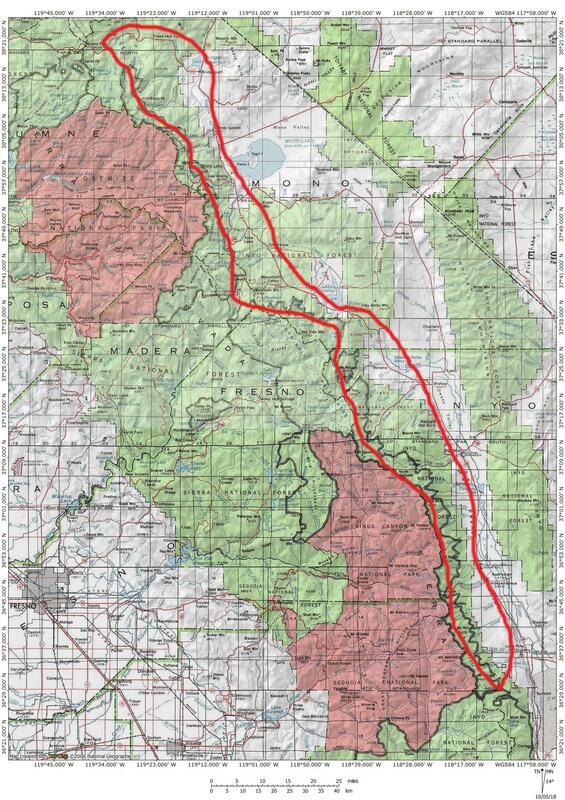 In truth, the area within the lines covers a distance of over 40 miles from north to south. It is stunning that so much territory burned. 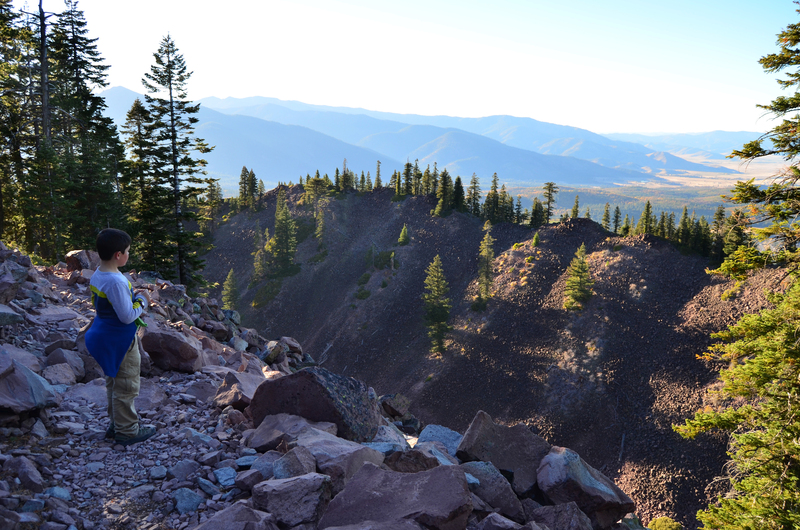 In spite of the destruction, the region remains beautiful and vistas from Mount Shasta like this one remain tremendous. The views from this spot reach further than just about anywhere else in California reachable by car. I may be wrong about that but if there are accessible vistas that reach further than this I’d like to know what they are. Worth noting, Snow Mountain was visible 135 miles to the south, but was out of frame in this image. To give some context to the image and to help give context to the image, I identified many of the landmarks and listed how far away they are from the Old Ski Bowl. We are blessed that, in spite of the destruction, this is still a beautiful and remarkable world! Old Ski Bowl view of a large lenticular stack sitting majestically above Mount Shasta. 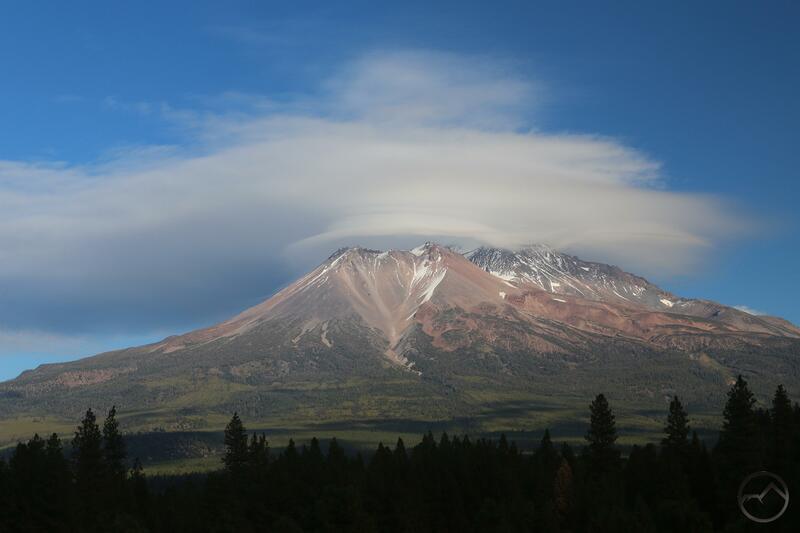 A couple of days ago I reported the first good lenticular Mount Shasta has had this October. We are now getting into the heart of a really active season for these majestic cloud formations and it is exciting to see what new marvels are going to unfurl above the mountain. 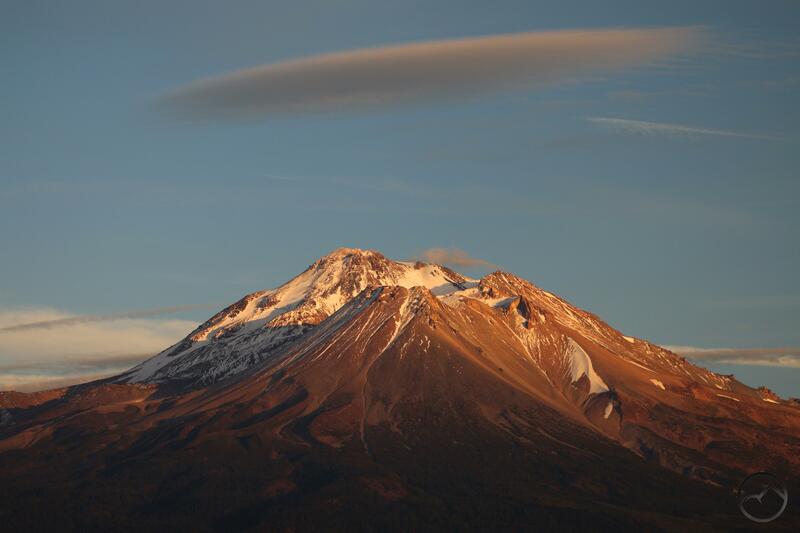 The two days following that first event has witnessed two additional lenticular formations over Mount Shasta. 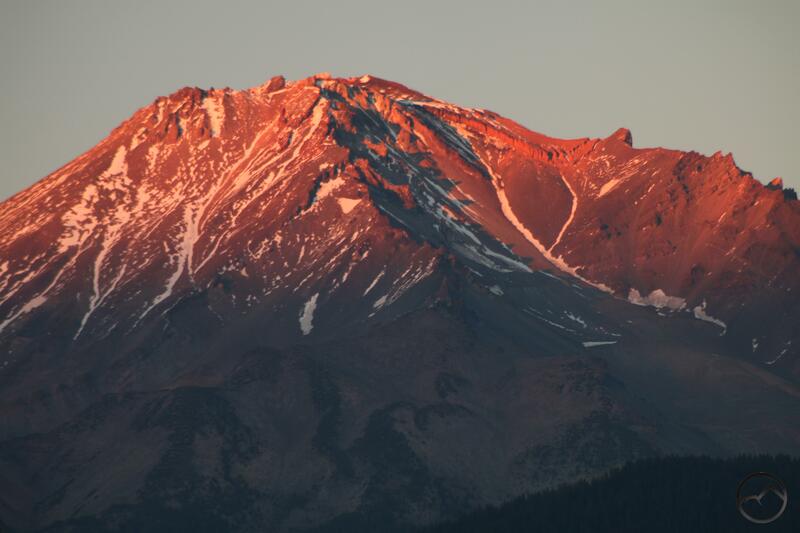 While never quite rising to the epic level, it has been a remarkable sight to witness, one that once again emphasizes the incredible, unpredictable beauty of Mount Shasta. The first lenticular was a beautiful but frustrating cloud. While at times that first event had a well-defined disk formed over Shastina, it was, in many ways a bit of a mess. In spite of the disk, it could not quite shake the blob of cloud that hovered just above. Nonetheless, it remained extremely scenic and was fun to watch as it changed and morphed throughout the day. The second day of lenticular activity was more subtle. The clouds that formed above Mount Shasta lacked the distinct lens shaped form. Instead, the mountain was capped with a succession of long waves. This proved a fairly stable lenticular and didn’t change too much for quite a while. Instead, there was quite a bit of other cloud activity in the sky, with cirrus and other types passing higher up over the mountain. Adding further interest to the day was the shadows cast by these clouds upon Mount Shasta and the lenticulars above it. While not colored by the rising or setting sun, it was a fascinating light show nonetheless. Around noon on lenticular day 3. 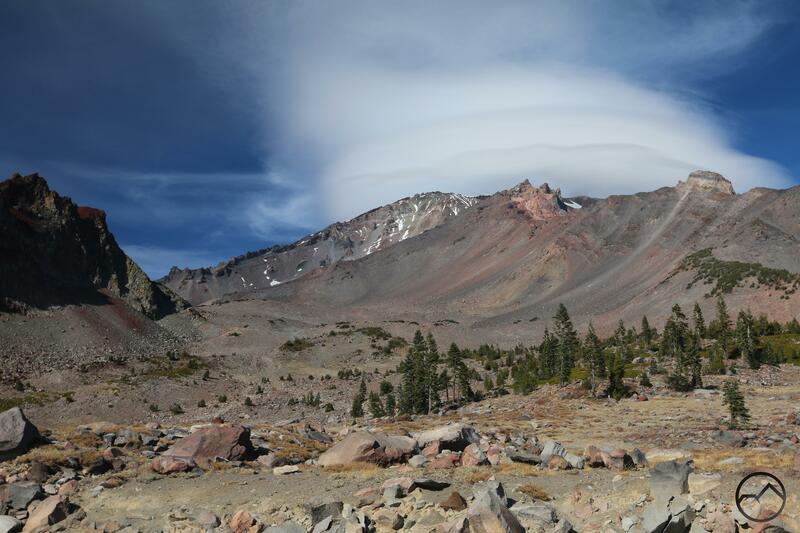 The third day of lenticular activity over Mount Shasta proved the most dramatic and diverse. In the morning there was just a slight wave present over the mountain, one that gave little indication of what would form later in the day. There were many other clouds, some threatening to take a lenticular shape but none of these were right around the mountain. By the middle of the day the sky had filled in considerably and a large lenticular stack had formed above Mount Shasta. The stack was not composed of extremely distinct layers but it was quite impressive anyway. By evening the stack had dissipated, leaving only a small wave, just as there had been in the morning. Thin clouds hovered higher up but nothing that gave the impression that the awesome formation that had crowned Mount Shasta earlier in the day would return. However, just before sunset, a small disk did form high above the mountain. While not the most inspiring event, it was at least a respectable finish to an otherwise compelling day of lenticular activity. Lenticular day 3, at sunset. A nice lenticular forms with a pronounced disk over Shastina . The changing weather patterns that begin on Tuesday have already brought the first lenticular. While yesterday morning was the first intensely colorful sunrise, so did Wednesday bring the first real lenticular of the fall season. 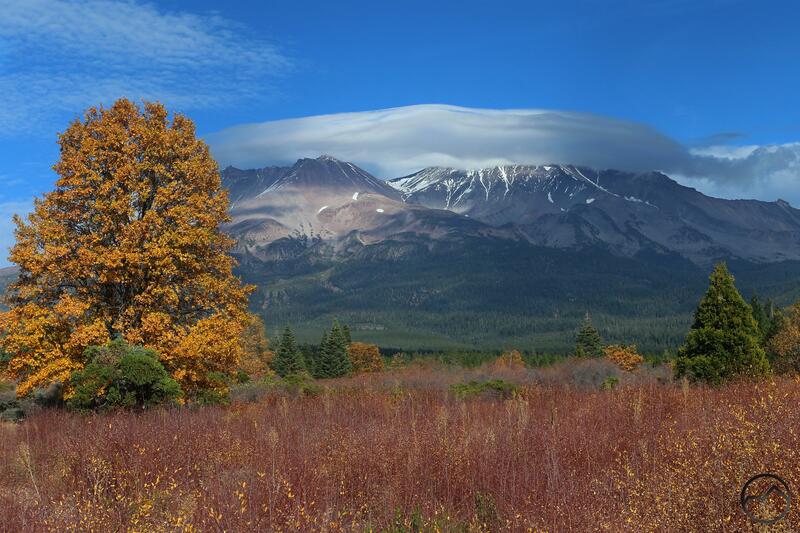 After many weeks of cloudless conditions, autumn is finally taking hold of the sky and bringing clouds, winds and interesting phenomena above Mount Shasta. Today started off rather overcast but by the afternoon the clouds had coalesced around the mountain and the classic disk of a lenticular was evident. It had a particularly distinct shape over Shastina, while vague stacks formed over the rest of Mount Shasta. It was not an epic lenticular event but it was beautiful and interesting nonetheless and demanded some attention. I popped out to one of my closest spots from which to photograph Mount Shasta and set my camera up. I captured the disk in strong form before the lenticular’s lines began to blur and the cloud grew over the area. Soon there were interesting mottled shadows all over the mountain’s lower flanks. As is often the case, it was fascinating to watch the evolution of the weather above the great volcano. Later in the evening I had to run some paperwork into town. I just happened to time it so that the sun was setting when I was headed in. It proved to be a frustrating exercise. Clouds above Mount Eddy in the west filtered out much of the light on Mount Shasta, leaving everything rather drab. Even more frustrating, the lenticular had evolved into a stack sitting right on the summit of the mountain but didn’t really stand out like it had earlier in the day. Fortunately, as the sun dropped behind Mount Eddy the light was able to pass underneath the cloud cover and finally lit up Mount Shasta. For a few fleeting moments it was bathed in crimson glory before fading out altogether for the night. This left the clouds above Mount Eddy, now dissipating rapidly themselves, as islands of color in the sky. This too was quite beautiful. In the end, this was a fine lenticular, but hopefully it is just heralding greater and more complex events in the near future! 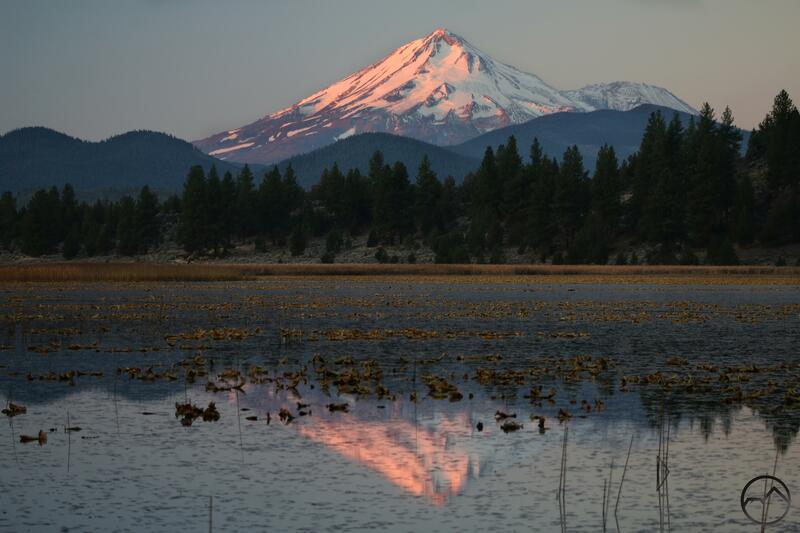 Lit up by the rising sun, Mount Shasta reflects in the water of Orr Lake. The east side of Mount Shasta is the loneliest side of the mountain. The area is sparsely populated despite being exceedingly beautiful. In particular, the area to the northeast is particularly notable. Watered by two perennial creeks, Butte and Antelope Creeks, there are many large meadows set amidst rolling hills. Vast stands of ponderosa pine are dominant though high desert influences are strong and juniper is found in many areas. Over all of this, the great icy cone of Mount Shasta looms majestically. This perspective on the mountain is especially satisfying, boasting a great view of the Wintun, Hotlum, Bolam and even a sliver of the Whitney Glacier, the four largest glaciers in California. This morning I got up early to head over to this remarkable area to watch the sunrise on ice-clad Mount Shasta. On the west side the snow that fell a couple weeks ago is mostly melted but on the north and east side and significant amount of fresh snow remains, complementing the glaciers. My destination was Orr Lake, one of my favorite spots in the Mount Shasta area. The large lake has a beautiful campground as well as a large group campground, fishing piers, a small boat launch and a great trail. Though it has been getting cold, I was still surprised to find the campgrounds empty. With the entire area to myself, I set up my camera by the lake and watched the mountain change colors as the sun came up. Typical of Orr Lake, the bird activity was immense and included pelicans and a bald eagle. The entire scene was sublime. After the sun was well and up, I packed up my camera and headed a few miles away to a beautiful aspen grove, looking to check out what condition the fall color was in. 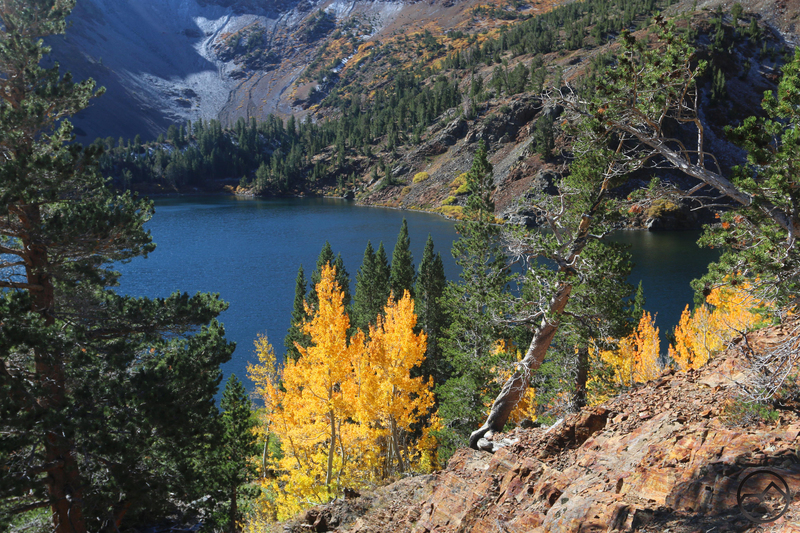 Aspens are not common in this part of California but there are a few groves on the east side of Mount Shasta. The drier conditions are likely one of the reasons these trees have established themselves in the area. Despite having taken root in this area, they remain rare, especially in large groves. Thankfully, there is a grove near Orr Lake that lies on public land. 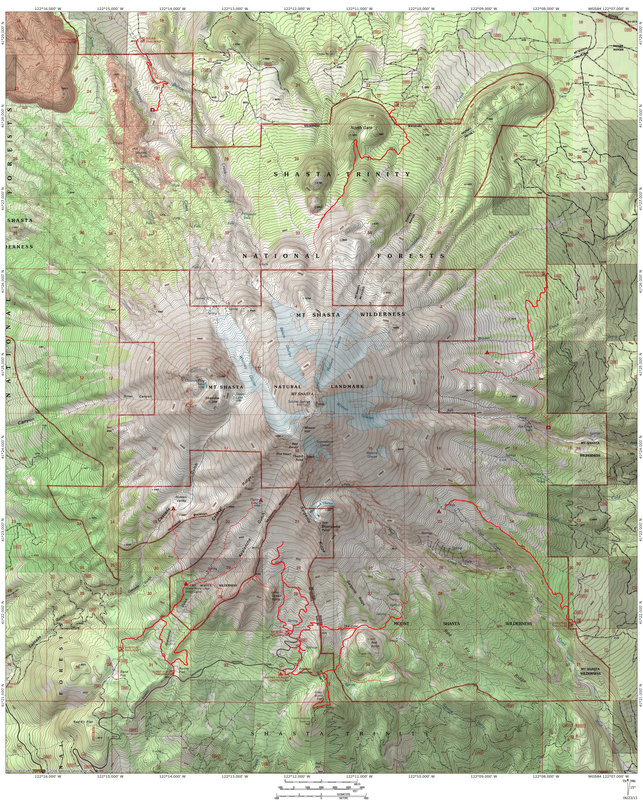 It is one of the largest in the Mount Shasta area and, to my knowledge, the largest one on public land. It is also very easy to get to. Not surprisingly, I was the only person at the aspen grove. I spent the next hour wandering around the grove, enjoying the morning light striking the gold leaves. The color was a little past its prime but the color was still quite attractive. It was a gorgeous morning. Considering the paucity of aspens in this area and the ease of access, I am surprised that a trail has not been developed through the aspen grove. Indeed, very little in this area has been developed for recreation despite the splendid scenery. 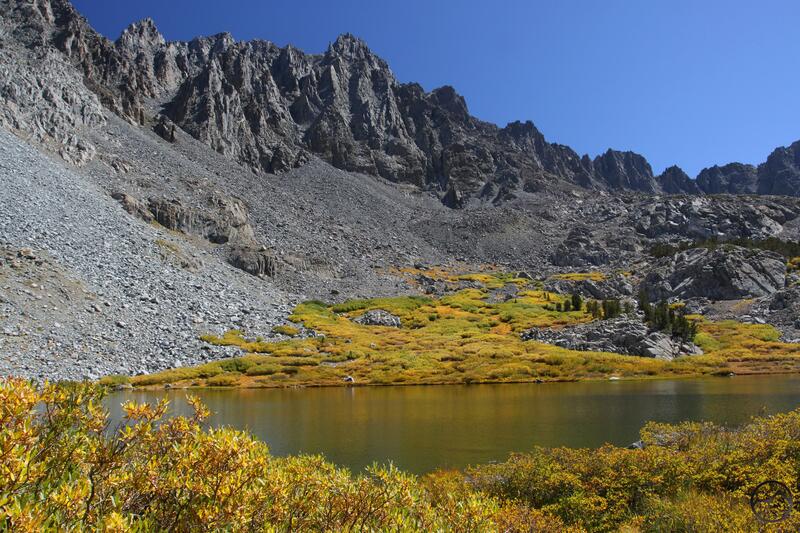 Orr Lake is the most significant site but it remains obscure and lightly used. 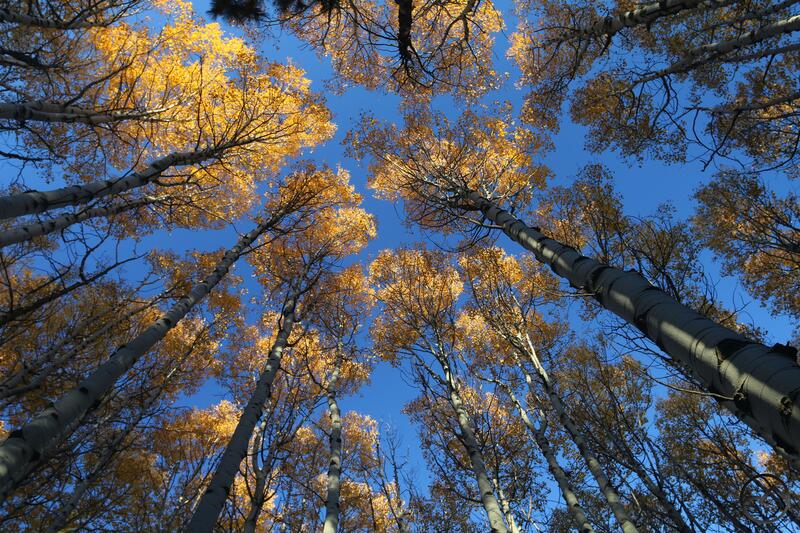 I really want to work with the Goosenest Ranger District to develop a trail through the aspen grove. It would be a nice path in summer but in fall, it could be a destination trail, drawing people from Mount Shasta who want to come and see the great color. For now though, absent a path, it is a remote, magical forest. 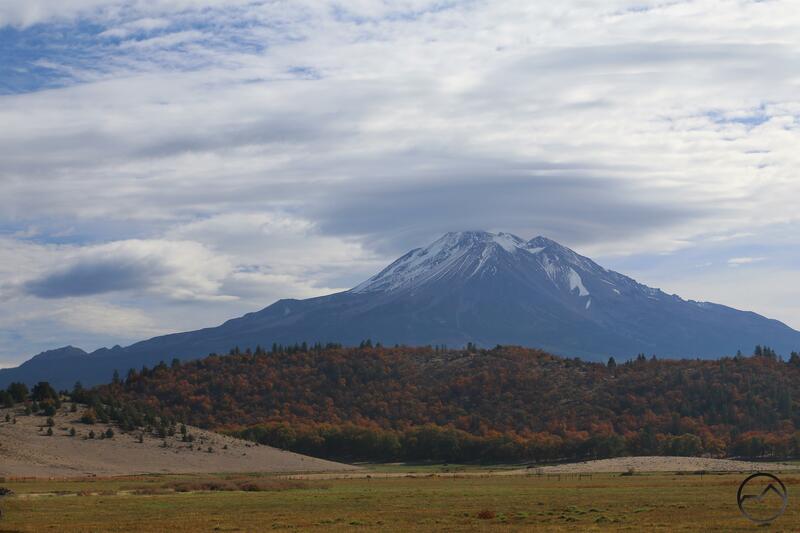 The east side is great any time of year but right now, with the chance to enjoy fall color and great views of Mount Shasta, it is a place of singular beauty. 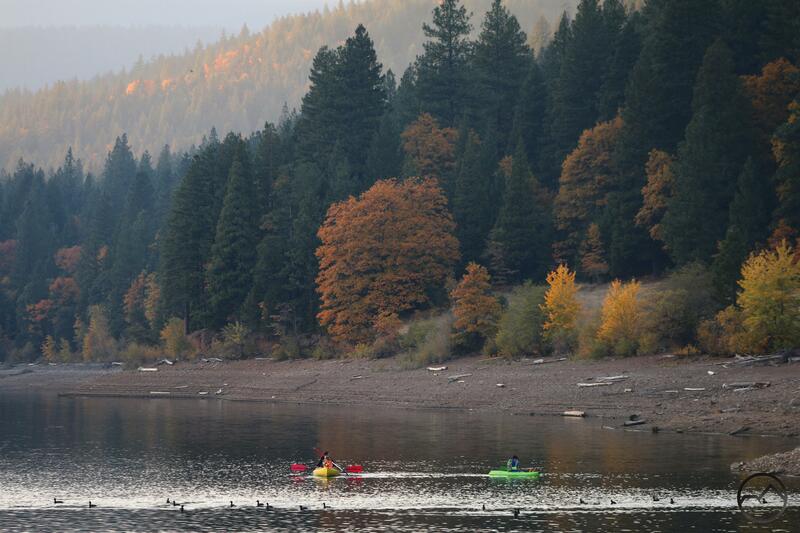 Autumn glow along Lake Siskiyou while my family paddles toward the inlet. Though it has been getting cold at night, the days have been perfectly warm. The forecast portends a change in weather next week, with temperatures dropping. My wife and I gave our son a paddle board for his birthday and yesterday was the best day to take it out and give it a try. Our younger kids rode with my wife while our son took his board for a cruise. They had a great time, though my son was already exhausted from hanging out with grandparents and hiking with the outdoor education class I teach on Fridays. Nonetheless, he took off around the lake on the board’s maiden voyage. While my family was having fun on the water, I enjoyed the view of the setting sun from the lake. 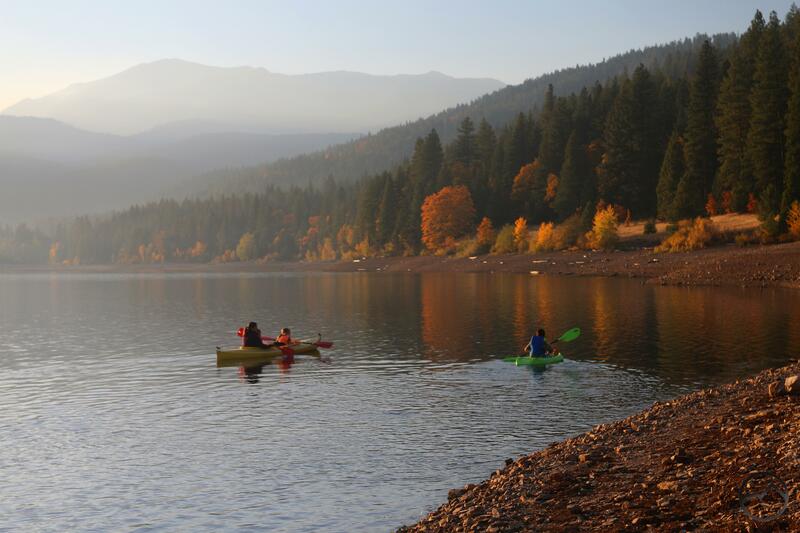 While the fall color in the area has been erratic, it is in full force at Lake Siskiyou right now. It is absolutely gorgeous. All the oaks and willows are turning shades of red, orange and gold. In the afternoon light all the trees just glowed. 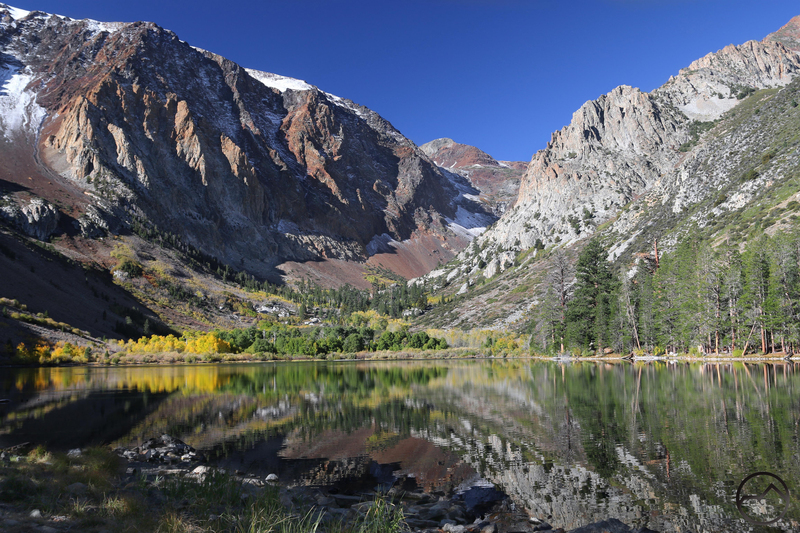 If you have the opportunity over the weekend, be sure to hike around the lake. The color is good in many places but it is particularly good along the north shore. As my wife and kids paddled, I got to enjoy the sunset from a location I don’t often take advantage of. Normally, if I observe the sunset from Lake Siskiyou, it is from the south shore, where there is a great view of Mount Shasta. This time, on north shore, the best view is to the west, where Mount Eddy, Porcupine Peak and the braided folds of the Trinity Divide dominate. Naturally, these were not lit up with alpenglow the way Mount Shasta is at sunset since the sun set behind these mountains. Nonetheless, the sinking sun put on a brilliant display of light beams and contrasting shadows. Of course, we eventually had to head home, but did so just in time to see the alpenglow on Mount Shasta come to an end. I was able to grab a quick shot before it was completely gone. It was a perfect evening. Now, tonight, I am taking the Cub Scouts up for an evening hike at Panther Meadow then we’ll watch the sunset from the Old Ski Bowl. That sounds like two ideal autumn evenings in a row! My son arrives on the summit of Black Butte. My eldest son turned 9 a few days ago. Among the many milestones he achieved around his birthday was his first ascent of Black Butte. My wife hiked with him while I stayed home with our two younger kids. 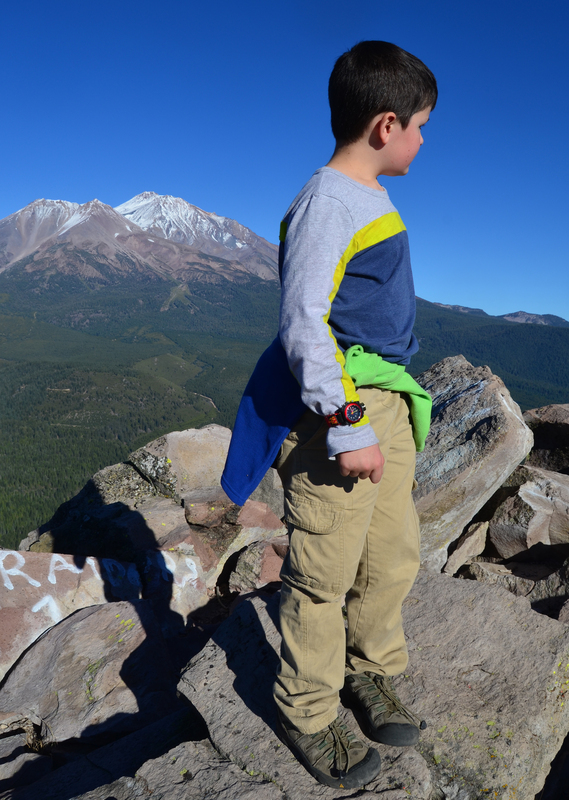 He has been wanting to climb Black Butte for a while now and was quite excited to make the journey. He has made longer hikes (including the 8.5 mile Panorama Trail in Yosemite at age 6!) but this was the first longish hike with a sustained grade that he has done. My wife reported that he handled the trail with ease. I am thinking next year will be Mount Eddy! 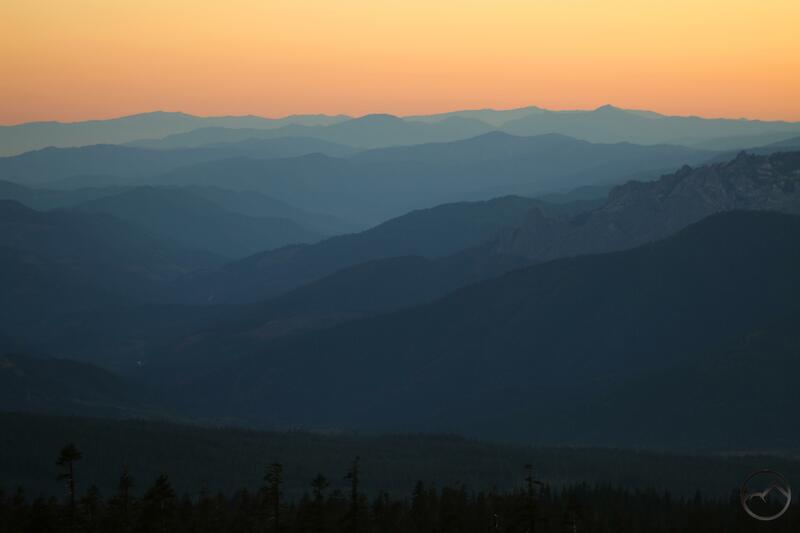 My wife and I live outside of Mount Shasta City, up on the crest of the Black Butte Summit pass. Unfortunately our line of sight on Mount Shasta is blocked by Black Butte but we do have a great view of this lesser mountain. 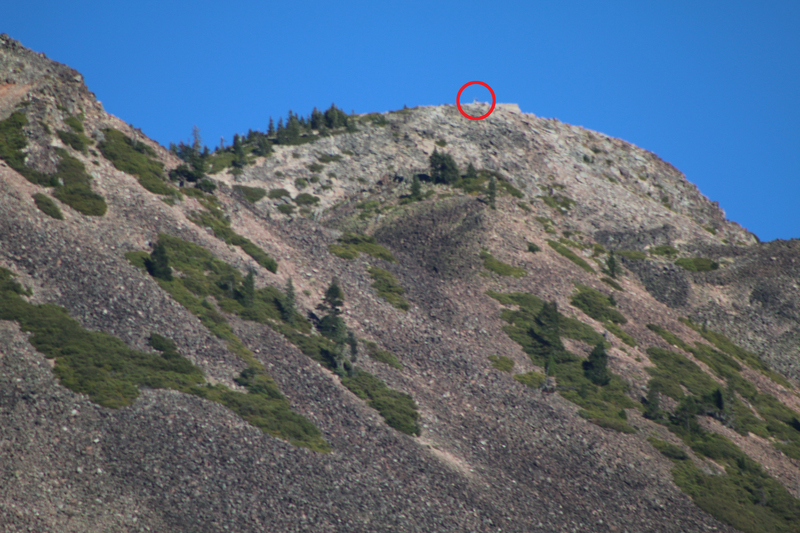 Since we have a good view of Black Butte (including the old lookout tower’s foundation, which is visible to the naked eye) my wife and I coordinated the timing so that, as they approached the summit, I was able to set up my tripod and camera with my zoom lens. While not high quality optics, this lens was good enough for me to see my wife and son on the summit of Black Butte! They were small specks, but their motion and the even the color of their clothes was discernible. You can see them in the image below. Be sure to enlarge the image so you can just make them out. While they were up there I tried signaling them with a mirror. While they did see a couple of flashes, the sun was essentially behind me and made catching it just right very difficult. 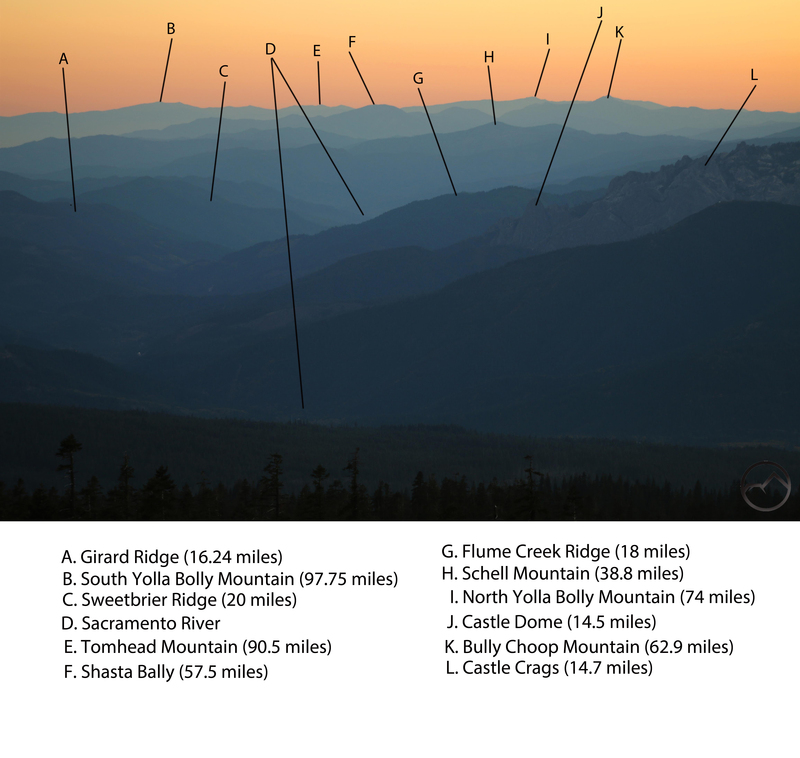 This got me thinking about putting an event together with the Boy Scouts, having groups ascend Black Butte, Mount Eddy and up to Hidden Valley on Mount Shasta and conduct mirror signaling to each group. That would be a grand event, one that could be witnessed from in town too! All in all, I think it was a very cool event. Of course, I am very proud of my son for making the hike up in such fine form. He is growing into quite the outdoorsman. He is hungry to get on the trail and explore more. Of course, we’ll have to get him out a little further from home next summer. 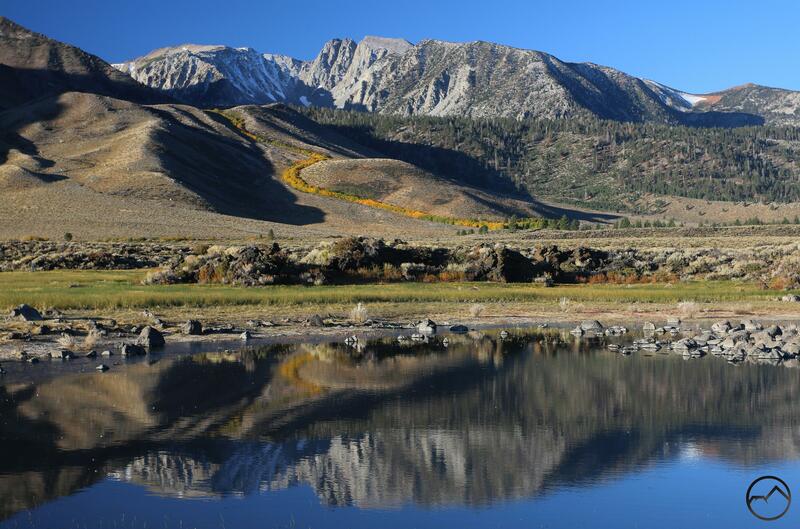 The summit of Mount Eddy is only 6 miles from our house!